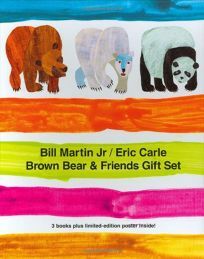 Brown Bear, Brown Bear fans will rejoice to discover the Brown Bear & Friends Gift Set by Bill Martin Jr, illus. by Eric Carle, under wrapping paper this fall. Three hardcover books plus a poster that integrates the starring trio come in a handsome corrugated box. In addition to Brown Bear, Brown Bear, What Do You See?, the set also includes Polar Bear, Polar Bear, What Do You Hear? and Panda Bear, Panda Bear, What Do You See? .